Game description: This is the European version of the installation disc for setting up the Playstation 2 Network Adapter. 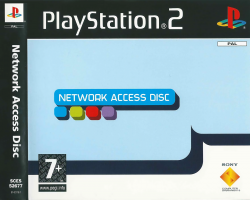 The disc's purpose is to install a file on your Memory Card containing connection settings, which will then be accessible by various games that had online capabilities. Aside from that it also contains some instructional videos on how to properly install the Adapter onto your Playstation 2 console. This gamedisc supports widescreen through the BIOS configuration. Implementation requires Full boot - "Boot CDVD (full)". SCES-52677 also includes the game Hardware - Online Arena. This page was last edited on 10 September 2018, at 18:21.